Mayweather: Nasukawa Can Dish it Out – But Can He Take It? 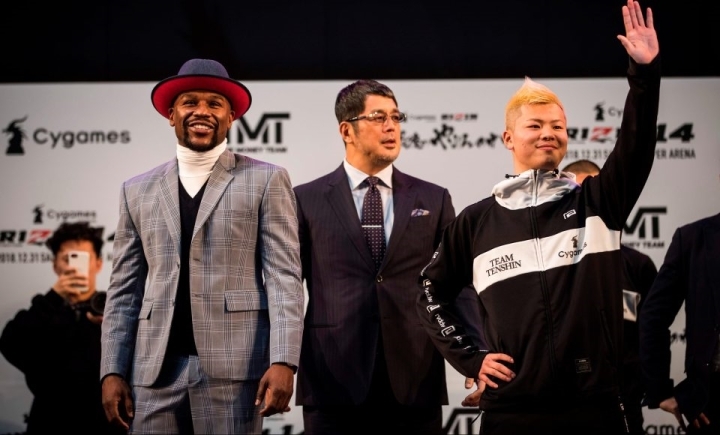 Floyd Mayweather is daring Japanese kickboxer Tenshin Nasukawa to put his money where his mouth is, when they collide in a three round exhibition bout. Mayweather was impressed with the footage that he saw of Nasukawa, but wonders if the kickboxing sensation can take what he dishes out. “I’m pretty sure he doesn’t have to worry about anything. Whether it’s sparring or an exhibition or a real fight, when you dish it out you have to be able to take it, so I’m pretty sure he’s going to dish it out, but he has to be able to take it,” Mayweather said. Mayweather hasn’t fought since beating Conor McGregor more than a year ago for his 50th win at T-Mobile Arena in Las Vegas. Mayweather previously said he was already making “seven figures” just by talking about it. If Nasukawa attempts use a kick or a non-boxing move – there is reportedly a penalty of $5 million. He acknowledged he didn’t understand what the English comments were saying on his Instagram account but added: “I love it.